Siddhartha's knack for value investment dates back to 1995 when he infused capital in Kshema Technologies, which was acquired by MphasiS. He also took an early exposure in Mindtree way back in 1999. Since 1995, he had invested in more than 15 technology companies including chip-designing firm Ittiam Software, and GlobalEdge Technologies, among others, says Debasis Mohapatra. In the winter of 1993, when Infosys, now India's second largest IT services company, was getting a cold response to its IPO on Dalal Street, it was V G Siddhartha who, apart from Vallabh Bhansali of Enam Securities and Morgan Stanley, underwrote a fair chunk of the float. It is another matter that Siddhartha didn't hold on to his investment and divested quite early. With Mindtree, he doesn't want history to repeat itself. As a patient value investor, Siddhartha has intermittently raised his stake in Mindtree for 20 years. "He's not the kind of investor who will just leave in a huff, giving in to the prospective buyers at the price point they want. It's true that he needs to monetise his holdings to fund the expansion of his other businesses, but he won't compromise on the price band what he thinks is the best," said a leading investor who knows Siddhartha personally and professionally. As the impending Mindtree stake sale makes headlines, this astute and media-shy investor is playing his cards close to his chest. He has held his belief that investment is a mind game since his 20s, when he left the comfort of his home to travel to Mumbai in pursuit of his dreams in 1983. Migrating to a big city for a job is common enough, but for a young man with an inheritance of around 350 acres of coffee estate in Chikmagalur, the coffee-growing region in Karnataka, it was an unusual decision. His initial days in Mumbai are movie script-worthy. Arriving in his dream city, Siddhartha walked into a Dhaba Hotel and rented a room with a shared toilet for Rs 120 a day in south Mumbai's Fort area. The next day, armed with a one-point agenda to meet legendary investor Mahendra Kampani of JM Financial, Siddhartha trespassed into his office without an appointment. Unfamiliar with elevators, he climbed six floors to meet Kampani. After a short wait and a healthy discussion, he got the lifetime opportunity to join Naveen Bhai Kampani as an intern. After a two-year stint with JM Financials during which he learnt the nuances of trading, Siddhartha returned to Bengaluru in to launch Sivan Securities -- a stock trading company (now operates as Way2Wealth). Subsequently, his childhood association with coffee prompted him to launch Amalgamated Bean Coffee Trading Company in 1992, which emerged as a leading exporter of coffee. Later, he replicated the Starbucks model in India with the launch of his signature coffee retail business, Cafe Coffee Day, in 1995. People familiar with Siddhartha vouch for his simplicity and self-depreciating style. "As a person, he is amicable and down-to-earth. As an empathetic leader, he personally connects with people," said a person who has seen him from close quarters. His knack for value investment dates back to 1995 when he infused capital in Kshema Technologies, which was acquired by MphasiS. He also took an early exposure in Mindtree way back in 1999. Since 1995, he had invested in more than 15 technology companies including chip-designing firm Ittiam Software, and GlobalEdge Technologies, among others. 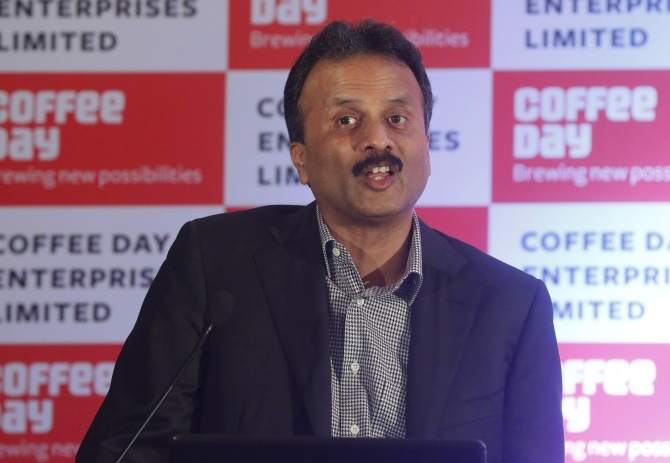 Other than the coffee retail chain and his investment in tech firms, the Coffee Day Group has now forayed into diverse fields in its bid to emerge as a business conglomerate in coming years. The group has forayed into real estate through its wholly-owned subsidiary, Tanglin, which develops technology parks and Special Economic Zones for the IT industry. Its logistics arm, Sical, provides end-to-end solutions in port handling, road and rail transport areas. The group has also ventured into hospitality through Coffee Day Hotels & Resorts. Way2Wealth is a leading financial service provider from Coffee Day's stable. Siddhartha's impending stake sale efforts in Mindtree is linked to his need for capital to grow his businesses. Brokerage firm reports suggested that Coffee Day Enterprises, with a consolidated debt of around Rs 3,500 crore, wants to pare debt. This decision is driven by the fact that the Coffee Day Enterprises' share price continues to trade below its listing price. While speculation is rife about multiple suitors for Siddhartha's Mindtree stake, his relationship with the IT major's founders remains sound, a testimony to his leadership. "While as founders of the company, we have a lot more emotional and intensity in the company, Siddhartha also has an equal level of commitment because in a way, he has also grown with the company," said Mindtree's Executive Chairman, Krishnakumar Natarajan. With relationships considered the most valuable currency in business, Siddhartha is the corporate leader to watch out for.